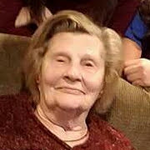 Estelle J. Giordano (nee Weyand) beloved wife of the late Ralph Giordano Jr. Loving mother of Laura Sue (D. David Adams), Michael (Carol), Paul & Beth Giordano. Devoted grandmother of Angelique (Jesse) Yemma, Tony (Amanda), Nick (Michelle) and Eric (Jamie), Josh and Tyler Giordano and great-grandmother of nine. Dear sister of June (John) Ammon and Betty Lou (the late Carl) Cody. Passed away April 2, 2018. Age 89 years. Family will receive friends Saturday, April 14, 2018 from 6:30 P.M. until time of memorial service at 7:30 P.M. at the Neidhard-Minges Funeral Home, 3155 Harrison Ave., Westwood. In lieu of flowers donations may be made to the Angelman Syndrome Fund, 75 Executive Dr., Suite 327, Aurora, IL 60504 or The Relapsing Polychondritis Awareness and Support Foundation Inc., 17310 NE 45th St. #119, Redmond, WA 98052.